The event was held last February, Sunday 28th and Brunei were represented by a few runners in the 21km – Half Marathon Category. Look carefully at the results below. 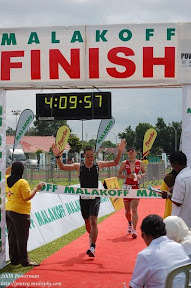 Brunei no 1 runner – Sefli Ahar got 1st place in the Master 1 category of the 21km Half Marathon. Check out the official result and the news report. There is a different in the time reported and official result.